Well, that didn’t take long. Only a few weeks into 2019 and we already have our first great movie. Shot in Dallas, mostly in one location, THE STANDOFF AT SPARROW CREEK is a tense thriller that maximizes its low budget, delivering a compelling, complex film. James Badge Dale plays Gannon, a damaged ex-cop and militia member. When he hears a report of shots fired at a police funeral, he and his fellow militia men assemble at their compound, as they try to figure out if they or any of their brothers in arms are suspects. When they discover some of their arsenal missing – including hardware used in the shooting – they begin to turn on each other. With the authorities closing in, they have to figure who could commit such a heinous crime, and why he would want to bring down the rest of the crew with him. To say much more would give away the film’s many twists, some of them gut-wrenching. The film definitely owes a debt to paranoia thrillers like THE CONVERSATION and BLOW OUT, and its interrogation scenes reminded me a lot of THE USUAL SUSPECTS. And for a film about violent men and a horrific crime, the movie is extremely careful about when it uses violence. James Badge Dale stars in ‘THE STANDOFF AT SPARROW CREEK.’ Courtesy photo. The cast is filled with “that guys,” character actors who have popped in everything from MULHOLLAND DRIVE (Patrick Fischler) to NO COUNTRY FOR OLD MEN (Gene Jones) and FRIDAY NIGHT LIGHTS (Chris Mulkey) to BOARDWALK EMPIRE (Brian Geraghty). They all play their roles perfectly, adding dimension to characters who may not say much, but all have intense reactions when backed into a corner. Denham directs with a lot of skill, using sparse lighting, but still letting us see exactly what we need to, and obscuring what we don’t. With several long takes, he lets his actors show off their chops, as they tell vivid stories that don’t need flashbacks to feel real (even if they’re not). But the secret weapon is Josh Ethier’s editing. He’s worked almost exclusively on horror flicks, and his masterful cutting ratchets up the tension, and makes the devastating reveals hit that much harder. THE STANDOFF AT SPARROW CREEK is a hidden gem, lurking in some theaters and on VOD. Search for it. You’ll be shaken, but glad for the experience. 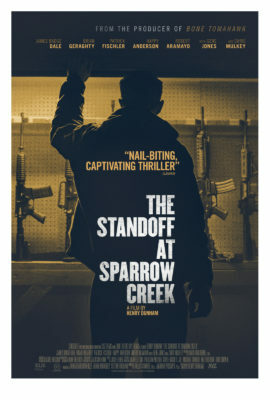 THE STANDOFF AT SPARROW CREEK is now playing in limited release and is also available on Video-On-Demand and Digital HD.